Double Utility Hook / Perfect for hanging Skis and Poles as well as other long vertical objects. The possibilities for this versatile slatwall accessory are endless. 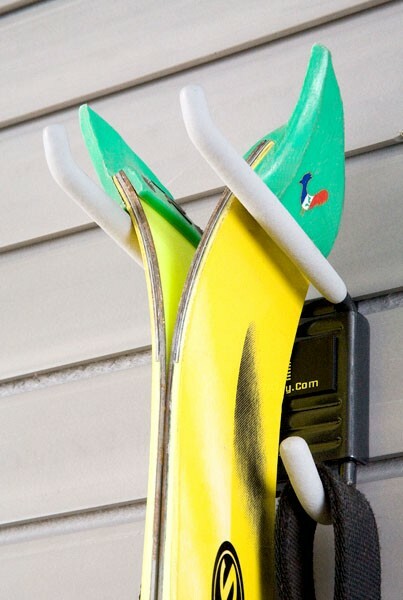 With a Double Utility Hook, the ideal solution to carefully store skis and poles has arrived! An excellent addition to your slatwall accessory organization system, provides durable storage for your favorite toys, tools and equipment. Graphite colored with non- slip tips is easily detached and relocated onto Wallscape slatwall if needed, via the uniquely designed tongue and groove feature.